To be honest, it’s not official Scrabble that I’m playing, but Wordfeud; however, for all practical purposes it’s the same. 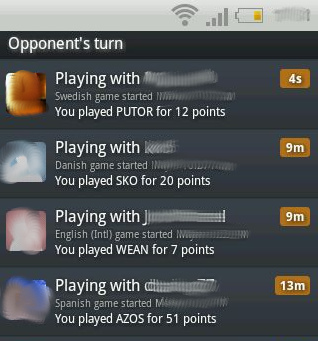 In particular I like to play simultaneously in several languages. I’m struggling a bit with Norwegian (because it doesn’t do Nynorsk, which is the variety I know), but I’ve played very enjoyable games in Swedish, Dutch and Spanish, apart from the obvious Danish and English. PS: If you’ve got an HTC ChaCha, too, did you realise you can take a screenshot by holding down the red button and pressing Home? We’ve just come back from a week in Keith (between Inverness and Aberdeen) with all of Phyllis’s family. One of the nights we decided to play a murder mystery game for eight players called Death by Chocolate that we had bought in the Agatha Christie shop in Torquay (Devon) last summer but never got round to playing. The instructions for the game claimed it would last 2½–3 hours (including dinner), so I decided to start it at 5.30, so that there was plenty of time to finish it before the kids’ bedtime at 9 o’clock. That plan didn’t work at all. The first half hour worked fine, but then the kids joined us, and it became impossible to role-play, and one or two of us had to keep leaving the room for various reasons. In the end, we stopped playing and didn’t resume till all the kids were asleep (apart from Amaia, who decided to join us instead) and we then played until bedtime. 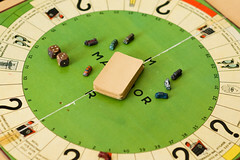 The game itself was quite good fun, but I thought it was too scripted at times – rather than being given dialogues to perform, I’d rather have been given the facts, told to memorise them and then been allowed to improvise for the rest of the game. Sammen med min gode ven Simon diskuterede jeg for otte år siden sandsynlighederne for at lande på de forskellige grunde i Matador. Så vidt jeg husker, gjorde Simon mig opmærksom på, at hvis man kan beregne sandsynligheden for at lande på felt y, når man står på felt x, har man en Markov-kæde, og det er simpel lineær algebra at regne ud, hvor ofte hvert felt besøges. Jeg skrev fluks et program til at gøre det for mig (det mest besværlige var at håndtere de forskellige Prøv Lykken-kort, såsom “Flyt tre felter tilbage”). De rå sandsynligheder har jeg placeret i bunden af dette indlæg, da de ikke er synderligt ophisende. 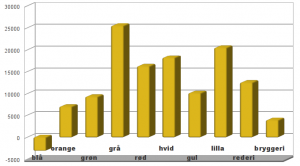 Hvad man virkelig ønsker at vide, er naturligvis, hvilke grunde, man skal købe, hvis man får muligheden. Dette er ret vanskeligt at regne ud, da det naturligvis er op til de enkelte spillere, hvor hurtigt de bygger huse og hoteller. Det er ikke uden grund, at Rådhuspladsen er berygtet blandt Matador-spillere! Men man kan jo ikke bygge på enkelte grunde uafhængigt at de andre i farvegruppen, så denne analyse er måske ikke så interessant endda. Jeg har derfor lagt værdierne i ovenstående graf sammen for hver gruppe, og resultatet kan ses til venstre. Lidt overraskende er de grå grunde den bedste investering, fulgt af de berygtede lilla. Interessant nok kan det slet ikke betale sig at investere i de blå grunde – de er simpelthen for dyre at købe og bebygge i forhold til indtægtsmulighederne. 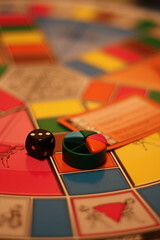 If you’re wanting to spend some enjoyable hours with a group of compatriots, Trivial Pursuit can be a good option. However, if you are not from the same culture, many questions – especially in the pink and orange categories – can become almost impossible to answer for some of the players. It would therefore be nice to have a box of international questions (either truly global, or perhaps European) to enable people with multinational families and friends to play the game. Latin America, Oceania, Africa, Europe and Asia. That sounds like it would be playable by people from different backgrounds, but it changes the nature of the game a lot, and I’d still rather have an international version of “proper” Trivial Pursuit. 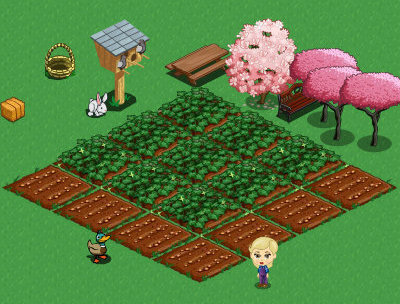 Most people will by now have heard of FarmVille, which is costing society billions in lost productivity because so many people are growing soybeans and raising sheep as part of their Facebook routine. However, most people think of it as a game for grown-ups. Just for fun I made profiles for Léon and Anna, and somewhat to my surprise, they love it. Of course I have to do most of the game controls, but they’re most definitely in charge of what they grow and where they put it. Anna is for instance insisting on only growing pink trees (see the picture). So I’m starting to think it’s really a game for wee kids, which adults just happen often to love, too.